Archives : VOLATILE WEEK,BATTLE ONTINUES - 22/10/2010. VOLATILE WEEK, BATTLE CONTINUES - 22/10/2010. MARKET IN BALANCE, NO CLEAR WINNER. The week gone by was very volatile to say the least. Despite so much volatility, the market ended the week with a meagre gain of 40 points on the Sensex and 9 points on the Nifty. The battle between the Bulls and the Bears intensified during the past week as the Bears continued with their aggression, but there was no clear winner as the Sensex formed a Doji on the weekly candlestick pattern, leaving the verdict undecided between the Bulls and the Bears for the coming week. The Bears are trying hard to disrupt the market momentum, but the flow of money is on the side of the Bulls. The current range of the Nifty is between 5950 on the lower side and 6130 on the higher side. 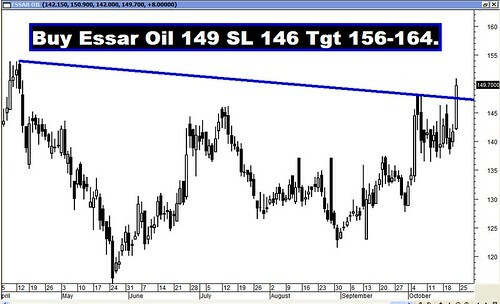 The direction of the breakout will be decided by who remains stronger in the coming week. The Sensex opened the week at 20160, made a high of 20351, a low of 19822 and closed the week at 20165. The Sensex gained just 40 points on a weekly basis. Similarly Nifty opened the week at 6112, made a high of 6127, a low of 5966 and closed the week at 6066. The Nifty too closed with a minor gain of 4 points on a weekly basis. Sensex has formed a Doji on the weekly charts which is a sign of indecision and uncertainty. But the long lower shadow is suggestive of the presence of buying pressure at lower levels. The Nifty has formed a Hammer like formation on the weekly charts but the body of the Hammer is black. Once again the long lower shadow is suggestive of the buying at lower levels. On the daily charts, both the indices have formed a Bullish Morning Star Reversal pattern between Tuesday and Thursday. On Friday, the indices have formed a small black body which is just a continuation of the uptrend. Last week the market had closed below the 20dma (Sensex – 20250 and Nifty – 6094) and as a result the short term trend had turned down. This week the market tried to regain the short term uptrend by closing above the 20dma, but that was for a very short period as the market slipped and once again closed below the 20dma on Friday. Hence the fight continues for the short term trend. At the same time both the indices are well above their 50dma (Sensex – 19353 and Nifty – 5818) and 200dma (Sensex – 17780 and Nifty – 5332) and hence the medium and long term trend continue to remain positive. In the current upmove both the indices have rebounded from Sensex 19771 and Nifty 5932 and in the process have registered higher bottoms. Sensex has formed higher bottoms at 19771-17819 and Nifty has formed higher bottoms at 5932-5348. The short term uptrend will be in danger only if both the indices close below their higher bottoms i.e. Sensex – 19771 and Nifty – 5932. The long term trend will remain intact as long as Sensex 17819 and Nifty 5348 remains intact. The correction is likely to continue only if the Sensex and Nifty close below the lows made during the week, i.e. 19822 for the Sensex and 5966 for the Nifty. If the market closes below the above mentioned levels, then we will see a correction of the recent rise i.e. from Sensex 17819 to 20854 and Nifty 5348 to 6284. In that case, the correction levels for the Sensex are at 19695-19336-18978 and Nifty 5926-5816-5706. In case the market corrects, it is likely to take support at the 38.2% retracement level i.e. at Sensex 19695 and Nifty 5926, which is almost coinciding with the previous higher bottom at Sensex 19771 and Nifty 5932. Expect strong support to emerge between 19771-19695 for the Sensex and between 5932-5926 for the Nifty. Let us we consider the Bullish Inverted Head and Shoulders formed on the weekly charts. Sensex fell from 15579 in Aug 08 to 7697 in Oct 08. 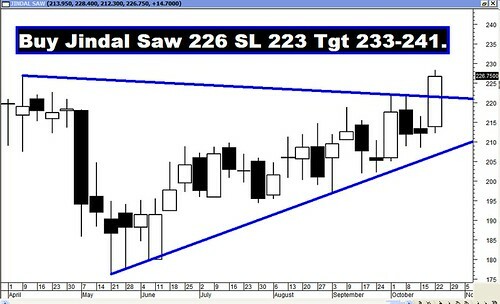 The target for this fall is at Sensex 23461. Similarly Nifty fell from 4649 in Aug 08 to 2252 in Oct 08 and the target for this fall is at Nifty 7046. The oscillators are painting a mixed picture as only the RSI, ADX and Stochastic have turned positive while the others continue to be negative. MACD continues with its Sell signal even though in positive territory. The Stochastic oscillator has just given a Buy signal as %K has cut the %D line from below. The ROC has given a Sell as it has turned negative. The momentum oscillator like the RSI has rebounded from 50 and has managed a close at 54 and as a result there is continuation of Buy signal. ADX is at 38 and the +DI has now once again started moving away from –DI and as a result the uptrend due to the Buy signal continues. MFI is at 45 which is signaling a short term Sell. Also the OBV continues with its Sell signal. The OI PCR is at 1.18 which is just about average. Next month Options data suggest that there is strong Call writing at 6200 and Put writing at 6000. In short the Nifty is likely to move between 6000 on the lower side and 6200 on the higher side. But if the range breaks on the higher side, then the Nifty is showing strong build up at 6500, which will provide strong resistance to the market. Sensex has Trendline Support at 19830 and Nifty has Trendline Support at 5967. For the week ahead, Sensex will find Support at 19954-19771-19557 and will find Resistance at 20432-20706-20985. For the week ahead, Nifty will find Support at 6005-5932-5870 and will find Resistance at 6127-6187-6260.